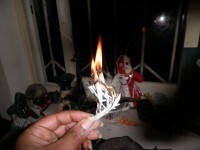 In American Hoodoo, some believe that when they do spells, they are working with "evil" spirits, and so they shouldn't use knots in charms. In some other African and diaspora traditions though, knots are very important in making charms. There is no right or wrong in this. It just depends on the tradition.